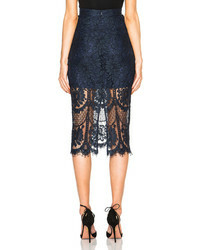 If you're in search of a casual yet totally chic outfit, consider teaming a navy blazer with a Lover halo pencil skirt. Both items are totally comfy and will look fabulous paired together. When it comes to shoes, this ensemble is complemented perfectly with navy suede pumps. If you're on a mission for a casual yet chic getup, choose a grey hoodie and a navy lace pencil skirt. Both items are totally comfy and will look fabulous paired together. Opt for a pair of navy canvas high top sneakers to make the outfit current. A white crew-neck sweater and a Lover halo pencil skirt is a nice pairing to carry you throughout the day. Tan canvas low top sneakers will deliver more playfulness to your look. If you're hunting for a casual yet stylish look, try pairing a mustard crew-neck sweater with a Lover halo pencil skirt. Both pieces are totally comfy and will look fabulous paired together. Spruce up this outfit with brown leather pumps. If you're after a casual yet chic ensemble, pair a grey crew-neck t-shirt with a Lover halo pencil skirt from Forward By Elyse Walker. Both garments are totally comfy and will look fabulous together. Spruce up this look with black and white leather pumps. This combination of a navy print crew-neck sweater and a Lover halo pencil skirt is super easy to copy and so comfortable to wear all day long as well! Take a classic approach with the footwear and rock a pair of black leather pumps.